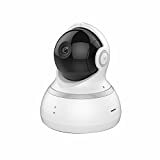 There are a few different wireless home security cameras that include motion tracking features, but more of them will cost you an arm and a leg. In fact, the Nest Cam IQ is probably one of the most popular examples and it costs a whopping $300! Before you dump that kind of cash, definitely check out the YI Dome Camera. For just $48 you get all the features you would expect from a home cam, plus remote pan and zoom as well as automatic motion tracking.